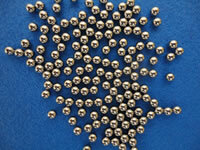 Chrome steel ball for bearings are manufactured from JISG4805 SUJ2(Equivalent to AISI E52100) steel. Those balls are using mainly for bearings. And also those balls have strong durability and withstand load therefore those balls are used rolling element of industrial machine. 440C Stainless Steel ball for bearings are manufactured from JIS G 4308 SUS440C (Equivalent to AISI Type 440C) stainless steel. 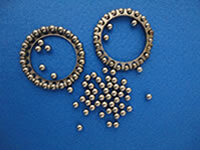 Those balls are using mainly for bearings, valve, electrical machine and optical applications. 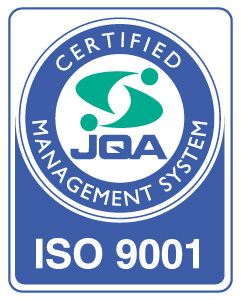 Carbon Steel Balls are manufactured from selected high grade JIS G3507 SWCH 10R-15A (equivalent to AISI 1010-1015) steel. Those balls are made by our original sintered process. 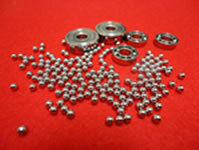 Carbon Steel Balls are manufactured from selected high grade JIS G3507 SWCH 8R, SWCH10R, SWCH10A, SWCH12A steel. 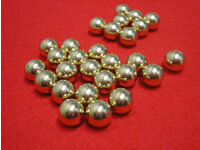 Those balls are used rolling element of light weight like caster and conveyer. 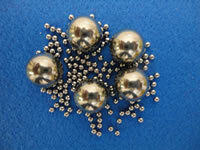 304 and 316 stainless steel balls are manufactured from JIS G4309 steel. Those balls are 100% rustproof. Particularly 316 are added molybdenum therefore 316 is more acid resistance than 304. Both of balls are not toughness of material. Those balls are widely used valve and their related equipment. 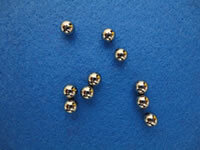 Brass balls are manufactured from JIS H3260 brass. 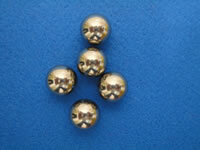 Brass balls have high degree characteristic of resistance to the many corrosive effects. For use Primarily in Valve applications. 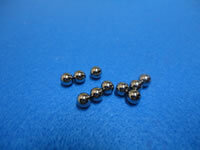 You can choose High Alloy Steel balls by each specification. 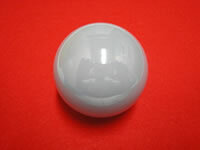 We can provide Cemented carbide balls, Hastelloy balls, Carpenter balls. 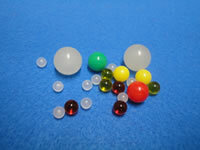 Each balls have specification that Chemical resistance, heat resistance and wear resistance. 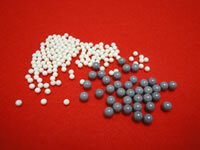 Polypropylene balls, Nylon balls, Acrylic balls, Polyacetal balls are light and have each specification. Please ask specification to our sales. Silicon Nitride (Si3N4), Almina(AI 203), Silicon Carbide ball (Sic) Zirconia (ZrO2) those balls are light and have each specification. Please ask specification to our sales.